By air, by water, and now on land, the Motor City completes its first motor sports trifecta this Labor Day weekend with the Belle Isle Grand Prix. Indy Cars, sports cars, and exotic prototypes take the classic stage offered by the island park beginning Aug. 29. This year, our need for speed was launched in June by the Red Bull Air Race between the skylines of Detroit and Windsor and continued in July with the 100th running of the Gold Cup powerboat races. The Prix prolongs that adrenaline rush. On race weekend, Saturday’s American Le Mans race will be broadcast live on Speed-TV. Sunday’s Indy Car Race will air on ABC. And Sunday’s Sports Car Club of America World Challenge GT race will be taped for broadcast later on Speed. But nothing beats being there when it comes to the Grand Prix experience. Television offers the only vantage point for viewing the entire two-mile long Belle Isle course; classic road courses aren’t panoramically all inclusive. This isn’t NASCAR. It’s an atmospheric experience, where exotic machines twist with the terrain and offer exciting glimpses on straightaways and in curves before disappearing behind trees where you hear only the high-revving engines as they rocket through another series of gear changes. The rule here is the higher you sit in the reserved-seating grandstands, the more you’ll see. And the row numbers start at the top, so the lower the number on your ticket, the higher you sit. But stay in your perch, and you’ll miss half the fun. Take a walk and get about as close as you possibly can without being a corner marshal. Feel the passing horsepower vibrate through your feet on the pedestrian bridges spanning the track. The Family Fun zone actually offers one of the closest access points on the track, and it’s a ground-pounding acceleration stretch. You can eat with the masses or dine with the upper crust. Tickets for as much as $700 buy grandstand seats and access to the chalets, where fans can dine like the corporate guests in hospitality tents that line the paddock and surround the James Scott Memorial Fountain. One-day general admission tickets can be bought for as little as $25, while grandstand seats go for $45 and up. A three-day pass for the highest grandstand seats can cost up to $155. An additional $25 paddock pass allows spectators inside the Grand Prix locker room. There, you can walk among the amazingly equipped car-hauling trailer-workshops and look over the shoulders of mechanics preparing the machines. Be sure to watch out for race drivers darting around on motor scooters. There will be driver autograph sessions in the paddock on Saturday, and you even get to walk among the cars on the starting grid before the start of Saturday’s American Le Mans race. Test-drive the event on Friday with free access to everything. All of the race cars will have practice sessions on the track. Indy Cars practice twice and the American Le Mans teams will qualify for Saturday’s race. Even the paddock opens for free after 4:30 p.m. Unless you have a VIP pass, there will be no parking on the island. A park-and-ride system with multiple satellite parking locations throughout metro Detroit and Windsor will be used along with downtown parking — all linked by a coach-style shuttle service. Last year, clean charter buses from Eastland Mall, for example, reached the island in 20 minutes. The line to board buses after the event was longer, but the company was good. Passengers on last year’s return ride to Eastland Mall included Indy Car crew members with interesting tales to tell. Part of the deal Roger Penske made with Detroit officials for use of the historic park through 2011 included a promise that all net proceeds would go to preservation and improvement of the island. That figure will be a minimum of $125,000 this year. Another $50,000 was given in June by the Indy Racing League to the Belle Isle Women’s Committee, which is working with the city, Friends of Belle Isle, and the Belle Isle Botanical Society to return the park to its former glory. Besides road upgrades and modifications for racing, lighting and drainage systems have been repaired and restorations have included the James Scott Memorial Fountain and Belle Isle Casino. For the second year in a row, Firestone will donate construction of another children’s playscape on the island. Indy Cars are just that, the same high-speed, open-wheeled, open-cockpit machines that race in the Indianapolis 500. As the 15th stop in the Indy Racing League’s 16-race season, Belle Isle is likely to play a major part in determining the season champion. The American Le Mans Series on Saturday features four classes of sports cars, from exotic prototypes to highly modified versions of Ferraris, Corvettes, Porsches, Panozes, and Dodge Vipers. The speed difference between the classes causes constant passing throughout the two-hour, 45-minute race. The SCCA World Challenge GT Championship has been added as a support race before the Indy Car race on Sunday. The cars are production-based and more familiar to American drivers, with Ford Mustangs, Chevrolet Corvettes, and Dodge Vipers competing with Porsche 911s and race-prepared versions of the Cadillac CTS. All of these race cars are eco-sensitive. Indy Cars don’t use gasoline; they burn 100-percent ethanol alcohol fuel. 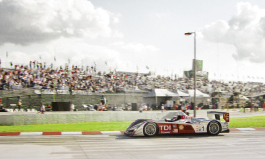 The powerful Audi prototype sports cars in the American Le Mans series have bio-fueled diesel engines. The rest of the sports cars use E10 or E85 ethanol blends. The 12-year war between rival American open-wheel series is over, and nobody is happier than the drivers. Starting fields have typically been 25-plus drivers this season instead of the 18 who competed on the island last year. This has brought together drivers from around the world, including rising second-generation stars Marco Andretti and Graham Rahal, and introduced new names like Australian Will Power. Unification also means actor/team owner Paul Newman may return to the island for the first time since the late 1990s to rejoin other famous team owners, including Penske, David Letterman, Michael Andretti, and Bobby Rahal. All of a sudden, young girls want to be race-car drivers. And men, well, she is the only racer ever to have appeared in Sports Illustrated’s swimsuit edition. Danica-mania struck with her arrival in the Indy Racing League four years ago. And she proved she can hold her own in this fast, overwhelmingly male crowd with her first victory earlier this season in Japan. A controversial crash that took out the leaders on the final lap last year at Belle Isle put her on the podium in second place for the first time in her career. She’s shown she’ll go wheel-to-wheel on the track and toe-to-toe in the pits with anyone who crosses her. With many of Indy Car’s biggest names defecting to NASCAR, the series has emphasized Patrick and her sometimes-volatile star power and the infectious élan of Dancing With the Stars champion Helio Castroneves. The course: The Raceway at Belle Isle is 2.096 miles long with 14 turns. A glamorous mix of automobiles, fashion, art, auctions, and parties, Concours is the single-largest fundraiser for the preservation of Oakland University’s Meadow Brook Hall. When: 10 a.m.- 4 p.m., Aug. 3. Where: Meadow Brook Hall and grounds, Rochester. Highlights: General Motors’ centennial, Ford Model T centennial, significant Ferraris, eight-liter Bentleys, 16-cylinder cars, flying cars, vintage motorcycles with sidecars. New this year: Vineyard on the Hill Gala, Meadow Brook Hall Loggia Terrace, 6 p.m., Aug. 2, and Destination d’Elegance at Meadow Brook Hall and grounds, with celebrity Chef Michelle Bommarito, 10 a.m., Aug. 2. Waterford Hills Road Racing Inc., metro Detroit’s only road course and auto-racing facility, marks its 50th anniversary this summer with a vintage car race at the track and cross-promotions at Meadow Brook Concours d’Elegance. At Waterford, regular spectators are fans of watching real cars driven by amateur race hobbyists on the paved, 1.5-mile, 12-turn track. Where: Oakland County Sportsmen’s Club, Clarkston. • Friday Evening: SCAMP Concours in the Park featuring race cars and touring cars, a silent auction and ice-cream social to benefit SCAMP, a five-week Summer Camp program for physically, emotionally and/or mentally challenged youth, founded in 1976. • Saturday: Qualifying and racing. • Sunday: All-day racing at the track. This year’s classic car spectacle, billed as the “world’s largest one-day automotive event,” is expected to draw 1.5 million spectators and 40,000 classic cars. Where: Woodward Avenue from Ferndale to Pontiac. When: 9 a.m.-9-p.m., Aug. 16 (though vintage cars begin cruising Woodward much earlier that week). • A car contest at the Northwood Shopping Center. 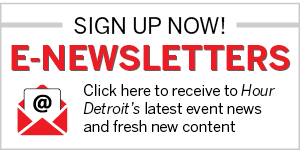 • Auto-related events in the city of Detroit during Cruise week. Details: “New Stuff” at motorcities.org. • Grand Marshal Troy Trepanier (custom-car builder), of TLC’s Rad Rides by Troy. • Official Dream Cruise music CD. Viewing tip: “I always recommend [that spectators] stay somewhat mobile to see cars in each of the host communities to get the full effect,” says Don Tanner, Dream Cruise executive director.